The leading provider of simulation based Electric System Operator training materials. Also please visit our e-commerce website www.powersmiths.biz to order our text book or DVD series directly. Powersmiths International, Inc. is a NERC recognized Continuing Education provider. We offer a number of products and services to serve the Electric Power System Operator. Our text book, "Electric Power System Reliability -2019"
Our seven disc DVD series which presents a video of a forty hour NERC Exam preparation course that we conducted. For those currently NERC certified System Operators, we offer NERC Continuing Education credits through our OPS-X simulator based training modules. Currently there are 7 modules available, each approved for 8 NERC Continuing Education (CE) credits for a total of 56 hours. Details are provided on the following pages. Powersmiths also provides on-site training and services related to compliance with the NERC Reliability Standards including gap analyses, audit preparation and mock audits. Powersmiths has over thirty years of electric power systems experience in operations, planning and engineering. We are deeply involved in helping companies understand and comply with the new NERC Reliability Standards. Our involvement is on three fronts. First we have a text book and set of DVD's that serves two purposes: 1) it prepares System Operators for the NERC System Operator Certification Exam and 2) it provides companies with background and knowledge related to the scope of the NERC Standards and requirements. Secondly, we offer NERC Reliability Standards compliance assessment and compliance maintenance services. We do this through on-site assessment and inexpensive and easy to use Standards, Requirements and Measures management software. We have guided companies through NERC audits with no violations found. Thirdly, we offer NERC approved Continuing Education for NERC Certified System Operators for the maintenance of their operator credentials. Wherever you happen to be on the compliance track, we can provide you with cost effective assistance. Our text "Electric Power System Reliability -2019" was developed specifically to serve those preparing for any one of the four NERC System Operator Exams. It along with the seven disc DVD series which is a presentation of a 40 hour NERC System Operator Exam preparation class can be ordered on the form below or by visiting our ecommerce website www.powersmiths.biz or through Amazon by searching Electric Power System Reliability on Amazon. More details on both of these products are presented on the pages below. You can order our Electric Power System Reliability Text book or our set of Exam Preparation DVD's by filling in the form above, going to our ecommerce website www.Powersmiths.biz or going to Amazon and searching for Electric Power System Reliability. Electric Power System Reliability -2019" is updated to include the material included in the new exam and is particularly structured to address application and analysis type questions. It includes the latest new and the revised NERC Standards and some new questions to promote understanding. Chapters 6 and 8 addressing Emergency Operations and Transmission Operations have been restructured to better address the types of questions asked on recent exams. The text is specifically designed to serve as an aid to power system professionals preparing for the NERC System Operator Certification Exams. Unlike the source material recommended by NERC and most if not all other resources in the industry, our text is updated annually. In this new edition, we have included all NERC Reliability Standards which are now in effect or will come into effect in 2019. This book is organized in seventeen chapters (326 pages) each addressing a fundamental of Power System Reliability. Rather than present the Reliability Standards strictly in the NERC alphabetic Standards blocks, the Standards are presented in the context of the appropriate power system fundamentals. This organization is designed to provide the technical information required to understand the Standards and provide relevance and perspective to highlight the purpose of each Standard or group of Standards. This presentation format is designed to frame each group of standards so that information can be more easily assimilated and retained by electric power system operating personnel. Each chapter is designed around a fundamental of Power System Reliability and its associated NERC Standards. Background information is presented to explain the purpose, intent and technical relevance of the Standards in that group. Key requirements of the Standards are summarized. Finally, any remaining requirements from the Standards group are presented for completeness. Questions are presented at the end of most chapters to allow the reader to test for comprehension. The new exam effective February 1, 2017 stresses analysis type questions even more than previously. That is precisely why we organized our text the way we did. We stress presenting the Standards in the context of Power System Fundamentals. This text is available in either hard copy or electronic pdf format from Powersmiths for $107. It features a presentation of all of the latest NERC Reliability Standards. Our OPS-X simulation Module I covers the basics of AC Power Systems including load and generation balancing and voltage control. Given the additional emphasis that NERC is placing on application and analysis questions on the NERC exam, some have found these simulations to be helpful in preparing for the exam. If you would like to order OPS-X Module I with the text, it is available at a cost of an additional $195. After passing the exam, you will be able to utilize Module I to receive 8 NERC CE hours at no additional cost. Please use the form above to order your NERC System Operator exam materials or visit our ecommerce website at www.Powersmiths.biz or order from Amazon by searching for Electric Power System Reliability. You may contact Powersmiths by emailing bill@opsxpert.com or calling at (770) 335-1872. Also please check the other pages on this site for training classes built around this text and our OPS-X simulator training program. Powersmiths is pleased to announce a series of DVD's to help prepare Power System Operators for the NERC System Operator Certification Exams. The corporate site license cost is $950 for the complete 7 disc series or $200 for each disc individually. 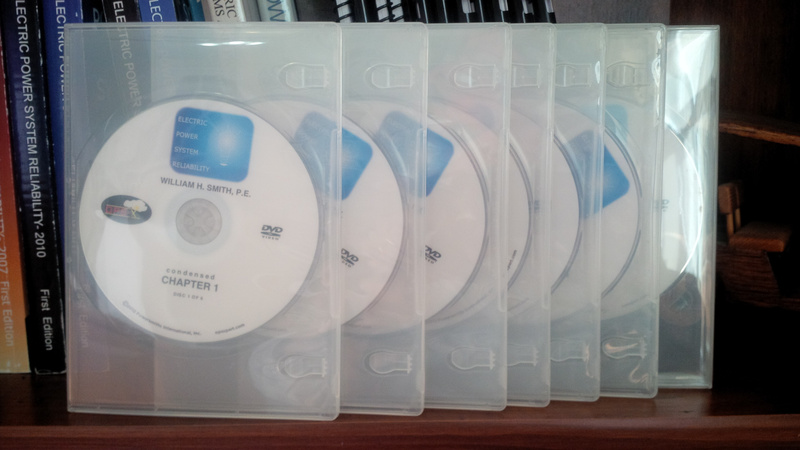 Up to five copies of our latest textbook, "Electric Power System Reliability" are included with the DVD's. OPS-X Module I is also included. We are also offering an individual license for $495 for the complete set of DVD's including the textbook and OPS-X Module I.
OPS-X is patterned after military jet simulators. It is two tiered. OPS-X will teach you the physics of power systems and more importantly, it will enhance your critical decision making capability. You will learn to think proactively and anticipate. You will apply the physics to prevent emergencies. "You really can't learn this from a book." The idea of OPS-X is that we teach the application of the physics of power systems in a stressful environment. Many know the principles well. Few can apply them properly under pressure. If you don't believe it, try the demo. Powersmiths has structured its total training program after the training programs used for both civilian and military flight training. Those programs consist of a ground school and an in-flight training program. In the ground school the fundamentals of aerodynamics and flight are taught. These fundamentals are then put into practice in simulators and finally in the air. The same is true for Powersmiths' Electric Power System Operator training. We have developed a text, "Electric Power System Reliability-2019" which presents the fundamentals of Power System operations and the NERC Reliability Standards. This serves as our ground school. We then follow that with our OPS-X simulation training package which allows the participant to practice the fundamentals learned in our ground school. Both the ground school and the simulation training can be achieved in a classroom environment during the courses that we offer once per month or they can be delivered in a stand-alone, self paced format. Please see the accompanying web pages describing each of these programs for more detail. 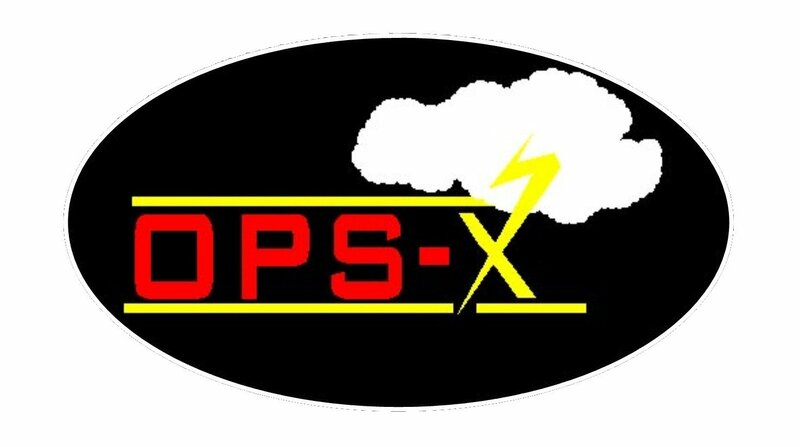 Welcome to Opsxpert, the home of the newly developed computer based electric power system training program OPS-X. OPS-X is the product of teaming between Powersmiths International and PowerWorld Corporation. Using PowerWorld simulation software, OPS-X presents Power System Operator training in a hands-on simulation environment. One objective is to place the operators out of their comfort zone, in unfamiliar circumstances, with a skinny power system, at faster than real time to develop and test instincts and reactions. System simulations greatly enhance the training experience and improve the retention of the material. OPS-X meets the NERC annual requirement for System Emergency Operations training and is approved under the new Expanded Operator Certification program. IF your NERC operator certification expires in the next three years, get started now in obtaining the CEH's you will need to maintain that certification. We have 56 CEH's available now and more on the way. To download a demo version of OPS-X, please go to http://www.powerworld.com/download-purchase/demo-software/ops-x-trainer-demo-download or call or e-mail us to schedule a webex session where we will take you through the OPS-X demonstration. If you previously downloaded our demo, you will need one extra file to run the program so that you do not get a message that the demo has expired. Please make us aware of this when you email us for the password and instructions. OPS-X is organized into 7 distinct simulation modules each with its own learning objectives. Each modules is approved for 8 NERC CE hours and varying numbers of Standards and Simulation hours. Each Exercise targets a specific area of Power System Operation. A text presentation describes the basics of the relevant operating principles and the Exercise objectives. These principles are then put into motion in faster than real-time power system simulations. Operators must respond to changing power system conditions to keep the system within basic operating parameters. Each Operator receives a score based upon their ability to respond correctly to the changing conditions. Powersmiths is offering each of its seven OPS-X Modules delivered in the self-study mode for $249. That's a total of 56 NERC CEH's, 56 Emergency Operations hours, 51 NERC Standards hours and 44 Simulation hours towards your NERC System Operator Certification requirement. If you order five or more modules, the cost is $195 per module. Site licenses are also available. Your satisfaction is guaranteed or your money back. The modules can be ordered on line at www.powersmiths.biz. The OPS-X training fulfills the NERC System Emergency Operations Training requirement and is approved under the new Expanded Operator Certification program. If your NERC Operator Certification expires in the next three years, get started now on obtaining the NERC CEH's that you will need to maintain that certification. We have 56 CEH's available now. This is the most effective and fun training that you will experience. Start with Module I. If you like it, pay only $195 for it and receive 8 NERC CEH's, 8 Emergency Operations hours, 6 NERC Standards hours and 7 Simulation hours towards your NERC System Operator Certification requirement. Once again, your satisfaction is guaranteed or you pay nothing. OPS-X is delivered via a CD and is a small PowerWorld based simulation program that runs stand-alone on your PC. The OPS-X training can be taken as self paced, independent study or it can be used in a team/role playing environment. www.powersmiths.biz to order on line. 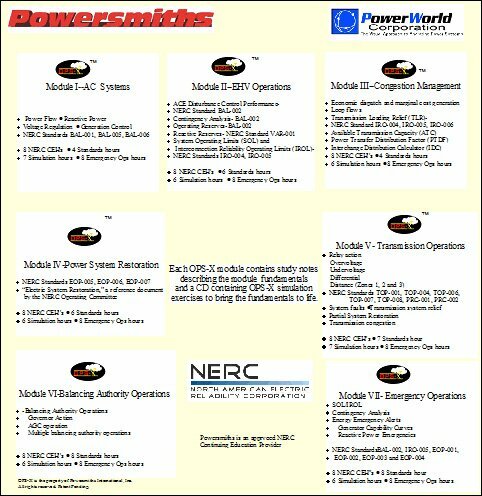 Powersmiths is the leading provider of simulation based Electric System Operator training materials. We offer courses for NERC CE Hour credit as well as courses to prepare potential operators to take the NERC System Operator Certification Exam. Bill Smith founded Powersmiths International, Inc. in 1997. He regularly consults in the areas of system operations, planning and engineering and has developed customized training programs. Prior to forming Powersmiths, he served in the U. S. Air Force and worked for Westinghouse, PTI and held various senior planning and engineering management positions at Florida Power and Light. Bill is a registered professional engineer in Pennsylvania, Florida, Massachusetts and Connecticut and a NERC Certified Reliability Coordinator. Bill holds Bachelors and Masters degrees in Electric Power Engineering from Rensselaer Polytechnic Institute. He also has an MBA from the University of Miami and attended the the PMD program at Harvard University.